The latest edition of Jon Reed’s accessible and practical book Get up to Speed with Online Marketing has all the strengths of the first version and more. When I reviewed the initial publication three years ago, I highlighted the book’s emphasis on the use of third party tools, such as applications, plugins and widgets that help non-technical folk get quick results without the need to brief and pay designers or developers. Writing back then I said, “Of course you could find all these online tools yourself if you had sufficient time. What Get Up to Speed… does really well, though, is help you know what does what and what’s worth spending the time and effort to implement. Some of the best ‘takeaway’ points from the book are simple, but it’s unlikely you would stumble across them unless you’d tried all these things out yourself.” All this useful information, along with constant reminders to focus on your overall goals and measure the impact of your decisions, results in a book that both builds confidence and helps you choose where to concentrate your efforts. What has changed since the first edition is the place of social media and online marketing within the business world. In the first edition, Reed takes time to persuade us that it’s worth investing in what he calls “the new marketing” in the first place. Now, we’re told, “social media is the mainstream”, a view I certainly share – which makes this book even more of an essential tool for any marketer, and especially for anyone who’s struggling to promote their own small business while also juggling all the other demands on their time. It may be the norm to use social media now, but the challenge for overstretched and under-budgeted marketers isn’t just about how to create websites, write blogs and set up social media profiles. The key marketing issues Reed focuses on are the need to be findable (in places where your customers already are) and how to build relationships with customers and contacts. There’s no doubt Reed (whose Publishing Talk community has over 280,000 followers on twitter) knows a thing or two about connecting with people. But readers also benefit from the accessible way in which he shares all his knowledge. The real-life case studies he reports on, the checklists and summaries he includes and the links to all those third-party tools make it extremely easy for anyone to see which social media tools they can use to do this, and what steps they should take to achieve their goals. A new ‘best practice’ feature at the end of each chapter provides a handy reference for how to handle each featured approach, a glossary helps you sort your ‘wireframes’, ‘pingbacks’ and ‘hangouts’ from your ‘CMS’, and regular FAQs (again, new to this edition) anticipate some of the key issues people are likely to find difficult. Reed’s also in touch with the latest trends. For this version of the book he’s dropped the chapters on virtual worlds (a cool development, but not something most people will actually use to promote their business) and social bookmarking in favour of covering Google+ and “one of the biggest social media sensations in recent years” (the visually-based Pinterest). He also features mobile platforms such as Instagram and Twitter’s video service Vine. Never fear, though, if you still want the old stuff you can download the lost chapters from the book’s website. As with the last edition, it’s the practical tips and “quick wins” that are likely to prove the most useful. Whether it’s setting up a hashtag contest (where you ask users to share images or ideas via a specific platform and keyword) to generate a buzz, using a social media client such as HootSuite to manage your workload or geotagging online images to gently promote your location, even the most social-media savvy reader is likely to learn a thing or two from these. And if all that sounds too much like hard work, Reed is also keen to make it fun. On the final page he exhorts you to “focus on what you enjoy, what you do best, and where you can add the greatest value to your business”. Overall, then Get up to Speed… remains an excellent, practical (and fun) guide to using social media to reach your markets while keeping your overall business objectives in mind. 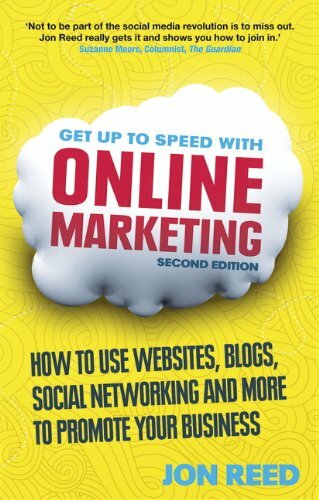 Find out more at the Get up to Speed with Online marketing: How to use websites, blogs, social networking and more to promote your business website, or follow the book on Twitter or Facebook.